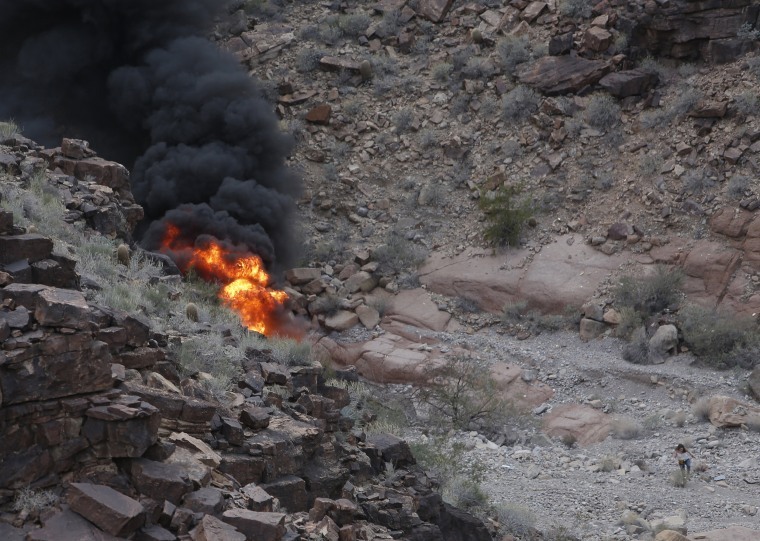 FLAGSTAFF, Ariz. — The parents of a British tourist who died after the Grand Canyon sightseeing helicopter he was in crashed have filed the first wrongful death lawsuit related to last month's crash. His parents, Philip and Marlene Udall, claimed in the lawsuit that their son could have survived if not for the post-crash fire and want to prevent others from suffering deadly burns, their attorney, Gary C. Robb, told The Associated Press. The lawsuit seeks more than $195,000, other unspecified damages, attorneys' fees and a jury trial. "There is no possible excuse for any helicopter not to have this simple but utterly effective technology, no excuse. None," Robb said. "If any helicopter executive spent five minutes with any of these burn victims, I guarantee every helicopter in their fleet would have it." The National Transportation Safety Board has repeatedly urged the Federal Aviation Administration to require that all helicopters have the systems. The FAA is considering it but right now they are required only for helicopter models that are newly certified after 1994, a requirement that aviation experts have called a major loophole. The Airbus EC130 B4 that crashed in the Grand Canyon was manufactured in 2010 but it is a version of helicopter that was designed before 1994. The NTSB report on the Grand Canyon crash won't be out for more than a year. A preliminary report released last month said the helicopter made at least two 360-degree turns before crashing with Udall, his five friends and the pilot aboard. Aviation experts said that indicates the tail rotor wasn't operating properly. Three of the passengers — veterinary receptionist Becky Dobson, 27; her boyfriend and car salesman Stuart Hill, 30; and Hill's brother, 32-year-old lawyer Jason Hill — died at the crash site. Udall's wife of three months, Ellie Milward Udall, later died at a hospital. All of them were British and on the trip to celebrate Stuart Hill's birthday.